Effective sourcing of generic medications remains a challenge for most hospital pharmacies. Managing product shortages, availability fluctuations, and price changes have become intrinsic to the purchasing process. In addition to the frustration this engenders, significant costs are incurred as a result of the extensive handling and oversight now required by staff to maintain optimal inventories. As such, it should come as no surprise that price is rarely the only factor in generic medication purchasing decisions. To explore hospital pharmacy’s experiences with generic drugs, PP&P polled a random, nationwide sampling of health system pharmacy directors in the third quarter of 2018. We asked about the factors impacting purchasing decisions, trends in budget support, off-contract purchasing, gray market usage, and a variety of other topics. A total of 261 pharmacy directors completed the survey, yielding a confidence interval of 5.92 (95% +/-5.92). Confirming pharmacy’s concerns with product availability, the survey results reveal small, but disconcerting, increases in the number of generic shortages and recalls, as well as gray market activity. Fortunately, few pharmacy directors have been caught unawares by these sourcing challenges; the vast majority has established appropriate budgets and assigned sufficient personnel to manage these issues. In addition, pharmacy’s previously circumspect interest in biosimilars has progressed to a strong commitment to adding these products to formulary as they become available. 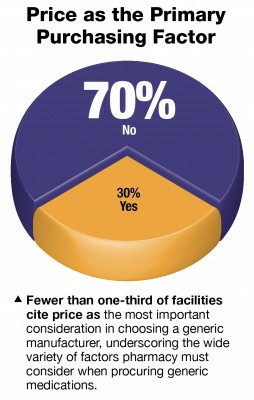 Most P&T committees are focusing on price and clinical evidence as they evaluate biosimilar products. It is also notable that pharmacy’s role on the P&T committee is well respected; products are almost never added to the formulary over the objections of the pharmacy department committee member.